Online Teacher Badli 2016 Primary Teacher Online Teacher Transfer 2016 Angeni Video conference Babat Latest Paripatra 02-04-2016. 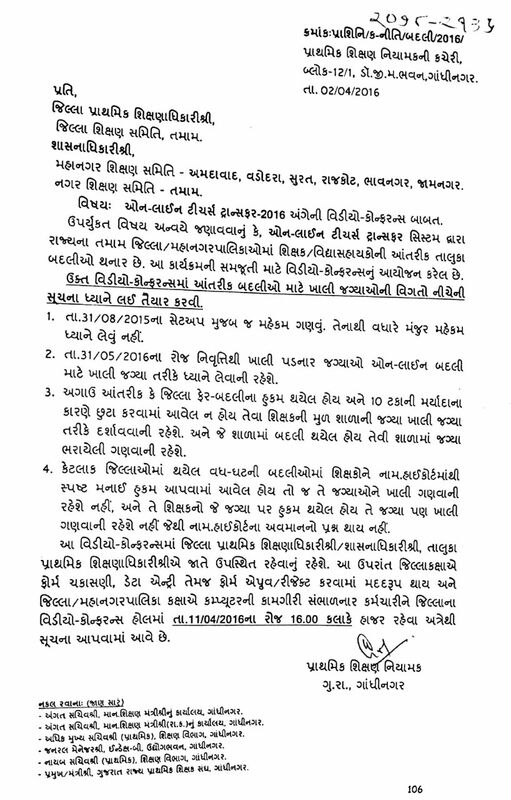 Uprokt Circular Anvaye Janavvanu Ke Online Teacher Badli System Dhwara Gujarat State Na Tamam District, Municipal Ma Teacher/Vidhyasahayak Ni Aantrik Taluka Badlio Thanar Chhe. Aa Online Teacher Transfer System Ni Samjuti Mate Video conference NU Aayojan Karel Chhe. Ukt Video conference Ma Aantarik Badlio Mate Khali Jagyaoni Vigato Suchano Dhyane Lai Taiyar Karvi. Aa Video conference ma DPEO, TPEO Ae Jate hajar Rahevu. Aa Uprant Jilla Kakshaye Form Chakasani, Data entry Temaj Form aproove/Reject Karvama Healpful Thay ane District/Municipal Kakshaye Computer Ni Kamgiri Sambhalnar Karmchari Ne Jilla Na Video conference Hol Ma Date 11-04-2016 Na Roj 4:00 pm Hajar Raheva Atrethi Suchana Aapvama Aave Chhe.